Kent, Wash. (Blue Origin PR) — Blue Origin is honored to enter into a Launch Services Agreement (LSA) partnership with the Air Force to leverage our commercial, heavy-lift New Glenn launch vehicle for national security space (NSS) missions. 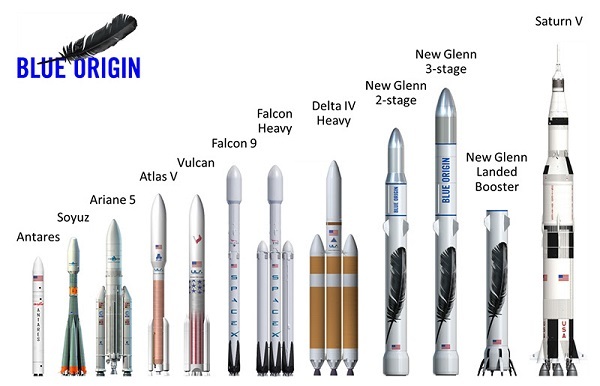 New Glenn is a single-configuration, operationally reusable launch vehicle powered by seven BE-4 liquefied natural gas rocket engines and offers significant performance margin for all NSS missions. The LSA partnership enables rapid buildout of NSS-unique New Glenn infrastructure such as vertical payload integration capability and a launch site at Vandenberg Air Force Base as well as completion of NSS certification activities. Blue Origin is proud to serve the NSS community and is committed to providing safe, reliable access to space for the nation. For more information on this announcement, check out the Air Force’s press release, Blue’s tweet and Jeff’s tweet. “single configuration” sounds like a dig at dial-a-rocket SRB configurations and multiple “heavy” upgrades. Both Omega and Vulcan are going to have a dozen or more configurations, each of which has to be independently certified for NSS launches. It also sounds like Blue has canned the 3rd stage concept completely, along with the 5.4 meter fairing. The basic advantage I see is that this gives Blue Origin access to VAFB. But mostly likely they will have to limit recovery to their ocean going ship because of the seal issues. I wonder where they will recovery the second stage. My guess would be at Kodiak as it is far enough west to allow a partial orbit, or maybe an orbit and a half recovery. I dont think that Blue is planning land recovery for NG…they have hired three of the “best” guidance people in the world…and it seems that they are moving toward a “fly back” system with the first stage for ocean recovery. Blue has not hinted at either upper stage recovery or land landings of the booster. Now all he has to do is build a working rocket like our friend, Mr. Musk and his BPR, uh, sorry, BFR. They’re all paper rockets until they fly.